of course any self-respecting freezer ALWAYS has a package of garlic bread slices in it. Yes, that is forbidden ice cream at the back on the right, but I limit my servings now to three or four teaspoons instead of packing the bowl to the brim. 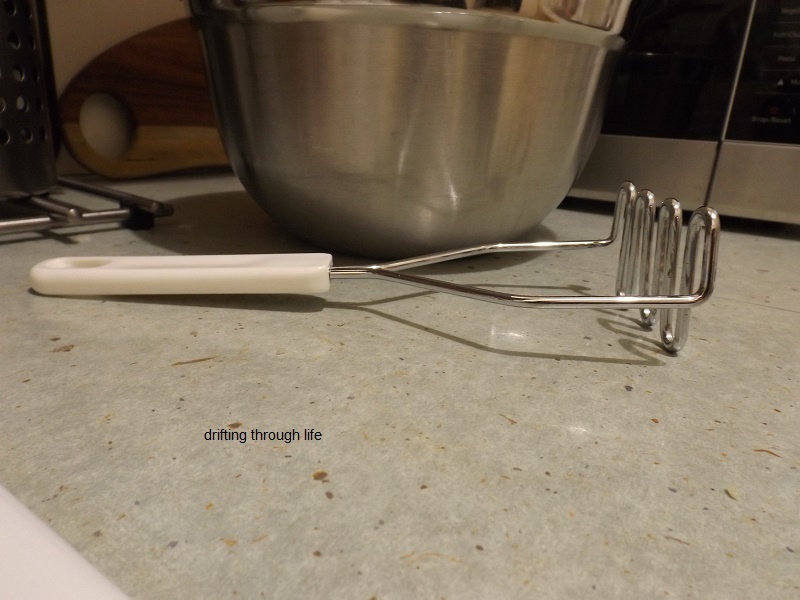 the preferred "weapon" for pounding the burger ingredients into submission, a potato masher. Why didn't I think of this years ago? 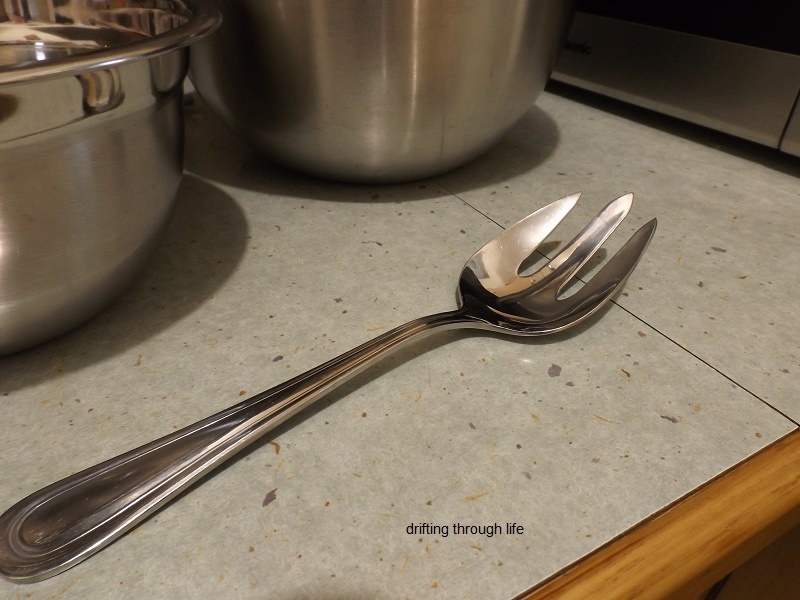 all those hours in the past of trying to blend burger ingredients with this giant salad server fork thingy. Good work and some good thinking on burger making. Because we print address labels at Christmas and for other things in the past, we buy the sheets of labels to go through the printer. We have a sheet to just pull some off if we need some. They were a bit hard to get the last time we bought them. The Big Blue Store doesn't have much variety with labels anymore, I noticed the last time i was looking for some. Perhaps you can find them online? We use those labels too. They work like a charm, and our many spice jars are also labelled with them. I like to cook in bulk and put things in the freezer too - particularly because we have such different diets. Mind you, it is past time that we checked/investigated the freezer. There may be some things which should go. The garbage goes out Monday night so perhaps that is a tomorrow job. Elephant's Child; my freezer is only two baskets under the fridge, not much chance of anything getting forgotten in there. My daughter's freezer is an entirely different matter, I'm afraid to open that one! You are so organized! I am not, but my printing is very similar to yours. I don't want to think about excavating my freezer, or revealing its contents. It's the tall kind. the left half of FRIG II. One thing for sure, it's minus two take-out-soup containers of ham and beans, and a baggie of neck bones. I must say, they were delicious, and will be again tomorrow. I need to get to town for some more sweet banana pepper rings to add on top, but we're expecting a glaze of ice overnight, and a dusting of snow. I can always use the remaining peppers for myself, and tell Hick that we ran out. Val; my daughter has a tall freezer, matching her fridge. Not as big as the original side-by-side that used to be mine, but a smaller set that I bought for them when the original died. I'm afraid to open her freezer, I'm sure even she doesn't know what's in there. And I just taught Laura to do this. She's a decent cook with a recipe, which generally is for more than two people. So, we can eat leftovers for a week. I am all in favor of leftovers, but she just refused to freeze them, and when she was tired of eating them, they were left to turn to mold. I finally had her calculate the cost of throwing out expensive food, and she converted to freezing. As opposed to relinquishing her allowance, which often did not rise to the value of the food. 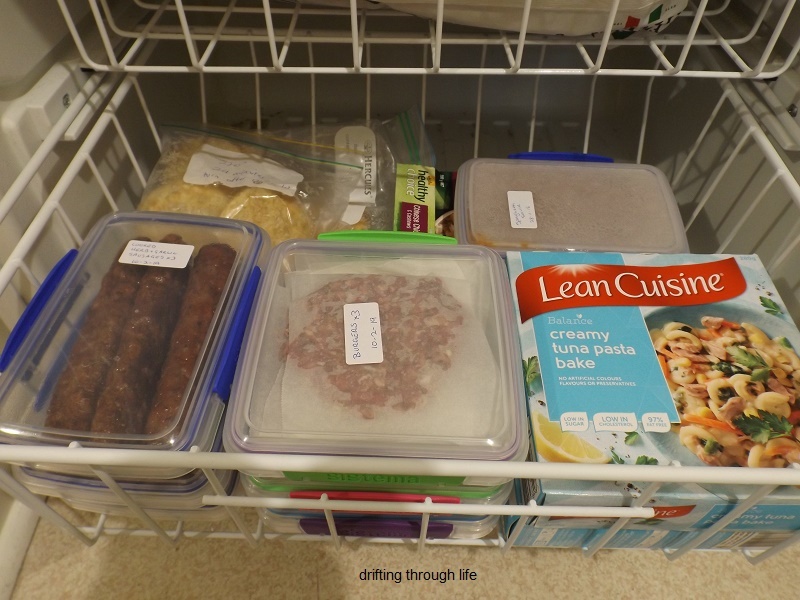 Joanne; learning to freeze for future meals is a great idea, as long as the future meals eventually get eaten and not permanently frozen. Having them labelled and dated helps with that because you know what's in there. Well done you. I had a huge chest freezer in my house and had to dump most of the packed contents when I moved. Now I have a large one on top of my fridge, much more manageable. Like you I cook a few meals at a time and freeze them. Soups, chili, sausages. I keep bread there too, living alone. 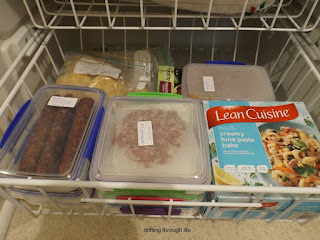 Wisewebwoman; we used to have a chest freezer when K was in the Army and we moved a lot, but always had sufficient notice so we could eat or give away most of the contents. 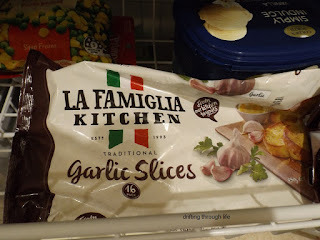 I'd like a larger freezer again, but not a chest freezer as I'm short and tend to fall in when reaching for something in the bottom. and I certainly don't need something large enough to feed a family anymore. 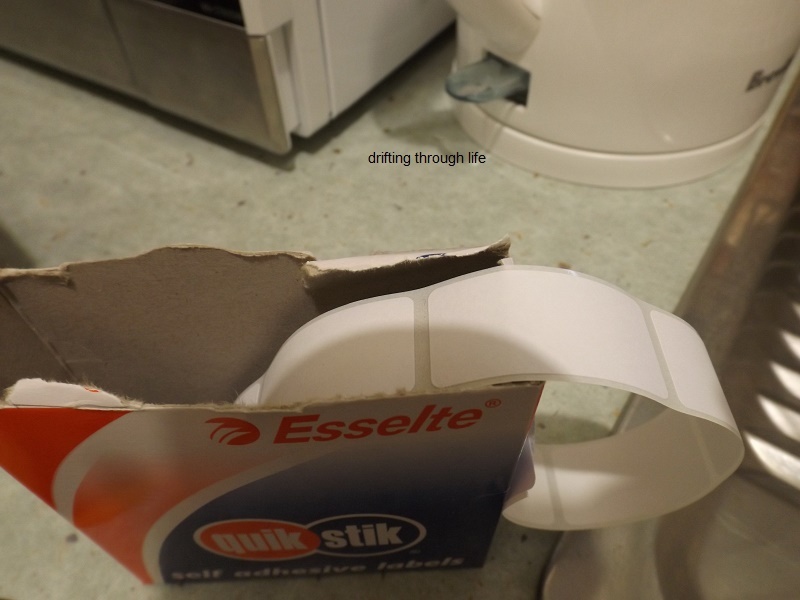 I do the same thing since I live alone. It is hard to just cook one portion at a time so I will prepare something like pot roast and put it in individual containers. This way there is always something ready for a quick meal. Arkansas Patti; it's a much cheaper method than eating out which is something people might do if they don't feel like cooking for one. I know a couple of people who do that and wonder why their pension doesn't allow for any savings. on the other hand, they don't have the cooking and cleaning up to do, but usually I don't mind that part. Mostly frozen pancakes, a few burgers and meatballs, some frozen veggies. It’s not that full right now. And it's never as beautifully organized as this. messymimi; I've never frozen pancakes, usually make just enough mix for three small ones and eat them that day for breakfast. 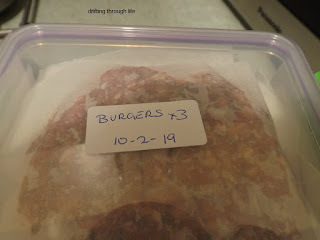 I've thought about meatballs, but really prefer burgers, it's the same recipe, just flattened to have on buns with salad. I like it organised, things are more easily seen. You are so well organized! When we moved to a retirement community, we had a smaller refrig/freezer. So we shop more often, buy less. Susan Kane; I shop more often now the shop is closer, but still buy less than before, unless I'm buying things to stock up the freezer, but then for the next few months I won't need to buy much more than fresh fruit and veg, plus milk and bread. You certainly have a tidy freezer now. Like how to do you labelling. What have I got in my freezer, well I have 3. I'll just tell you what's in the one in the kitchen. Frozen peas and beans. Steak, Pork chops, Fish, Pork Sausages, Frozen Stir Fry Vegetables, Ice Cream, Ice and Bread Crumbs. Because we have family at home we need this storage..
Margaret-whiteangel; I remember the amount of stuff I used to freeze when I had four ravenous kids at home. 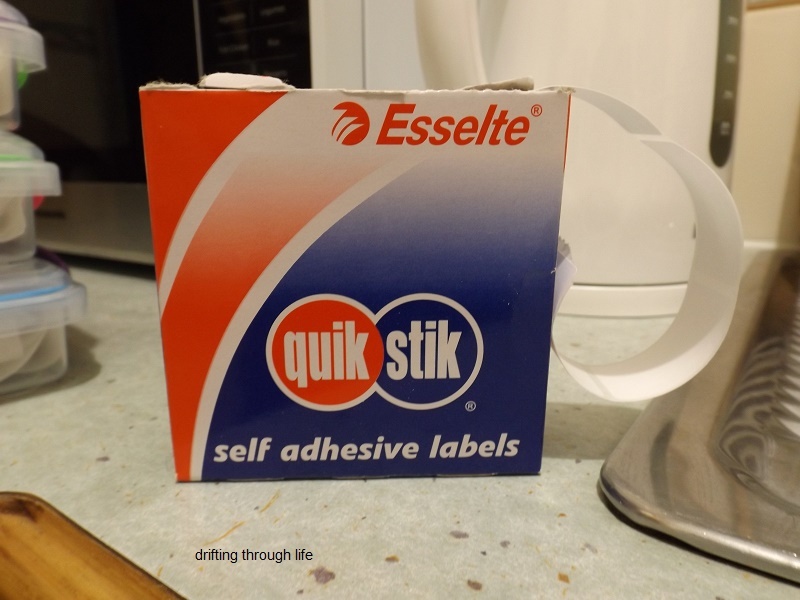 I had to label by shelf as well as by individual packs. 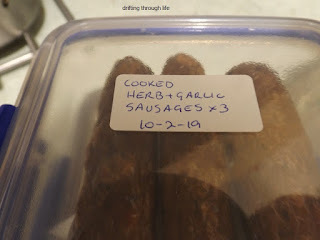 So I had a shelf for bread, one shelf for frozen veg, one for small things like sausages and packs of bacon, hot dogs etc, and one for ice cream and other frozen sweet things, then a chest freezer in the laundry for the big meats like chickens, roasts etc. peppylady (Dora); I've never frozen cookies, but I have baked cakes and brownies and such, then cut them up and frozen them in lunchboxes. 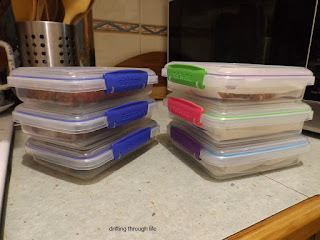 Easy then to take out just one or two slices of anything and pack it in a school lunch or have it for afternoon tea when someone comes to visit. 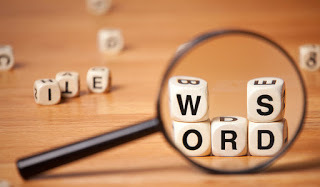 You are wonderfully organized and neat. I'm good at freezing things and terrible at using them up. I always think to myself, "I'll wait until I really NEED a quick meal" and then it slips my mind that I have stuff in there and I'll find it a year later. Not a good system at all.